I'll admit, I'm a strange man. Based on things you may have seen me write in the past on websites, you may think I'm just seemingly obsessed with anything that goes in a person's mouth such as straws or musical instruments, but really, it goes further than that. If I see a fictional character hold or use an item and said thing is cute, I'll probably buy it so I can own it...then rarely use it. Whether that's the intention of the show (like Pretty Cure) or not, I have a strange desire to bring those items from fictional universes to reality, to own (and use) them myself. In this new series, we'll look at items from anime and sometimes video games, show my real version, and in some cases show what the items were based on but not mentioned due to unfortunate legal brand restrictions. To start this series off, let's talk about a neat instrument that never fully got my attention until my aforementioned obsessions took over. Get ready, this is a long one! Many years ago, I got WarioWare DIY, which I consider one of the best games in the series because of how it allows you to create your own microgames, music, and comics (though I only use the first two). I started remaking commercial music (badly) and video game songs in it, and at one point, I was looking through the instrument list. Said list has five tabs with eight instruments each, which have small icons to represent them. See that blue thing? The upper-right icon? Yep, this was my first encounter with it! One of those was a light-blue, rectangle-shaped object with piano keys on it, named the Melodica. It sounded like a harmonica (and the real instrument I own does have a similar sound), but its scratchy sound discouraged me from wanting to use it in any of my music. I don't know if there's a single song I used it in, though I think Atmospheric Glide's WWDIY version would use it now due to the recent instrument change. No other melodica appearances were sighted after that game, until around 2018. I don't know what I was doing, but somehow I stumbled upon screenshots of the first episode of an anime named Your Lie in April, which showed a blonde girl playing that instrument again! At last, the melodica isn't just 16x16 pixels! It's clearer now! Thanks, anime girl! 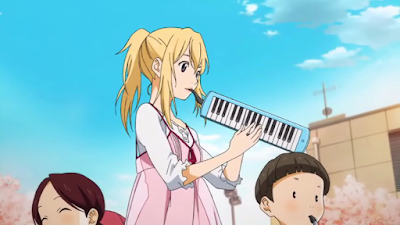 Of course, by now, I had forgotten the name of that instrument, so I read on a wiki and found out that the blonde girl was named Kaori and she was playing the melodica, even though that isn't her main instrument. After I found out what it was, I searched on Google Images for melodicas meant for Kaori cosplays. Some looked pretty close at this point, but the thing is, I don't stop at "close enough"; I kept searching, looking at every screenshot I could find of her playing her melodica so I would have more references before continuing my search for the melodica. In two screenshots I found, a black handle could be seen on the back of the instrument, which is where she held it with her left hand, shown below. 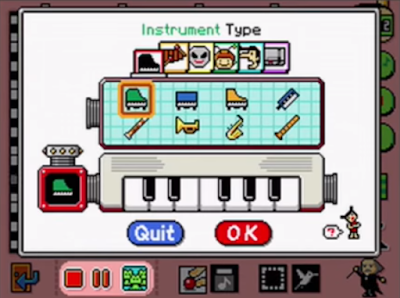 At this point, I knew they had to use a specific melodica for reference when drawing it, as it was seemingly drawn very precisely, with a consistent 32 keys visible, the aforementioned handle, and the random circle at the end of the instrument. With all of this, I went back to searching, and stumbled upon the Yamaha Pianica series of melodicas. 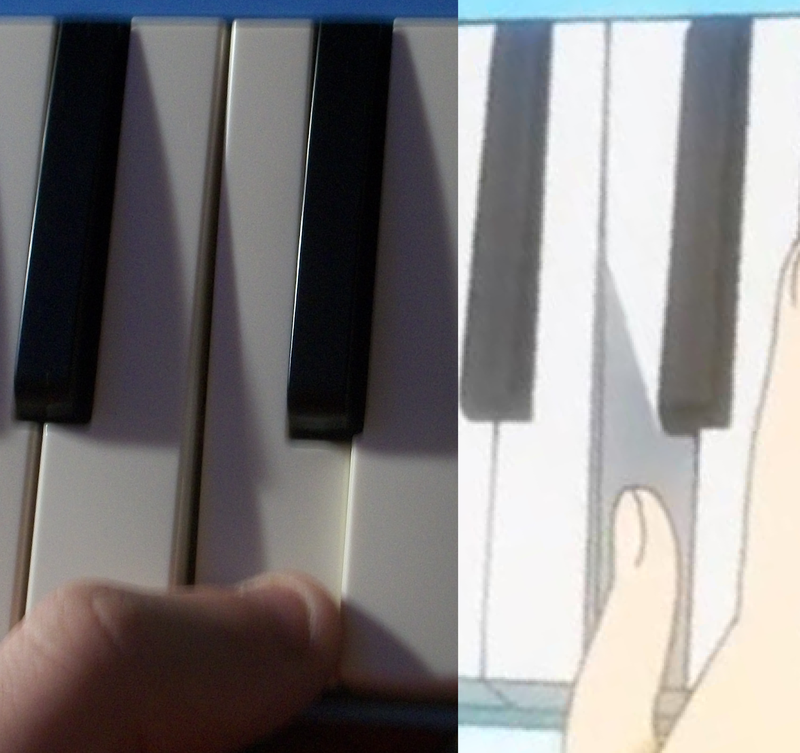 I looked at various pictures of a blue-colored Pianica and it strangely had all of the details they drew on Kaori's melodica! The black handle, the circle cleaning button, the 32 keys...all of it was there! Finally, this is the part everyone's been waiting for, the part where I show its real counterpart. However, I believe I chose the wrong Pianica. It's definitely the same series they used for reference (and are the same ones used in Japanese schools), but I went with the newer P-32E rather than the P-32D, which has indented parts on its backside that match Kaori's perfectly, which were moved on the P-32E to around the middle. For those wondering, yes, the blue Yamaha Pianica P-32D is what Kaori's melodica was based on, and is what they use in real Japanese schools as part of music class, where kids have to learn to play it. This is probably why Kaori is randomly not playing a violin here. With that said, let's get to the comparison! Ignore the slightly brighter blue they use; For whatever reason, they overuse bloom or something non-stop, causing colors to look overly soft. If that effect wasn't in the anime, it would probably be the exact same shade of blue. I know hands are a nightmare to draw, but whose fingers look that weird...? 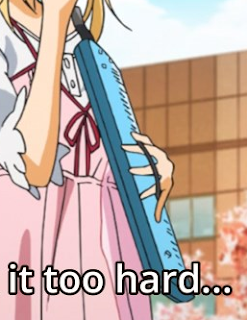 First, can we stop and look at Kaori's weird hands? When she's playing the melodica, her fingers are always flying around the keyboard at insane speeds, usually hovering over unrelated keys that she never plays! All of this is done while she can't see what keys she's pressing, either! 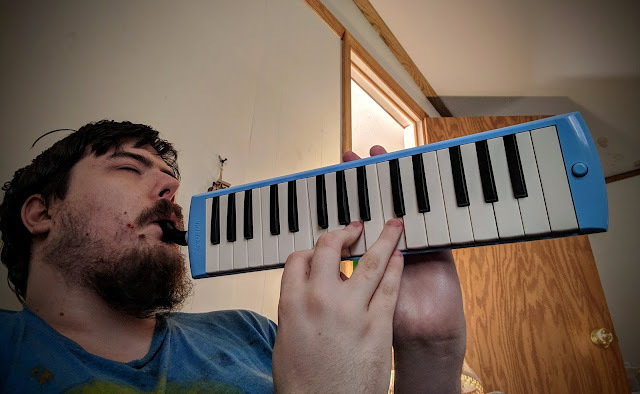 Trust me, in honor of Kaori, I play my melodica using the same orientation, and I literally can't see any of the keys from where my eyes are. She must be this good because she isn't real. Who can dance and move their hands around a keyboard while controlling their breath? Fake girls. Seriously, who can play this fast while being basically blind? Anyways, with that aside, take a look at that picture. I couldn't see what my camera was pointing at because I had to hold the melodica with both hands to mimic Kaori's weird finger positions, but trust me, what you can't see is basically as spot-on as the rest of this fake melodica! Both ends are rounded, but suddenly change angles where the lines are drawn in the anime version. The mouthpiece is nearly identical, but the real version tapers off slightly vertically at the end that goes in your mouth. Light reflects off it just like in the anime, though. 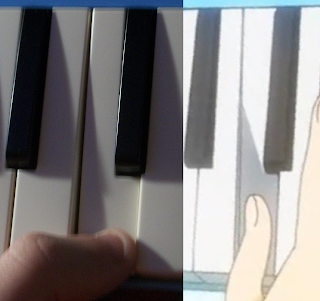 As shown to the left, the round cleaning button at the right end of the melodica is the same. On the real melodica, holding this while blowing into the instrument forces spit out of the back. What are these random indents? Seriously, what's their purpose? A strap...? Now, moving to the back... Whoever drew this scene didn't care about putting much detail here (unlike "it too hard..." picture above, which has the holes), but they did include the black handle and two dots. 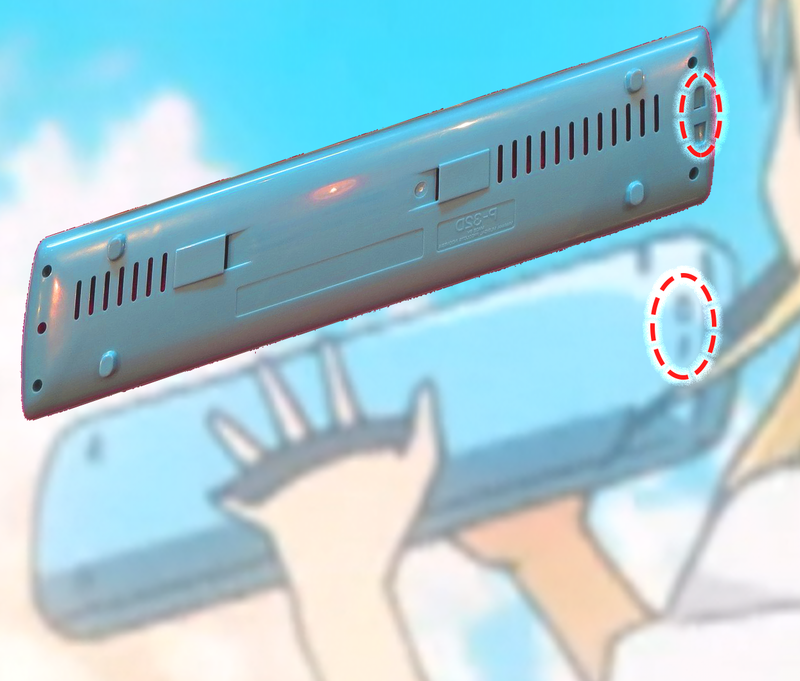 Why did they not draw the holes but drew these random indented parts? I'll never know, but this picture shows that this matches the P-32D. You can even see the four "legs" it sits flat on! It's like the animators hated how Yamaha wouldn't let them legally use their name so they left clues like this behind for only someone as obsessed as me to follow. Now, I don't know where else to put this in this blog post, but I feel I want to talk about this instrument here so I don't create a redundant second one in the future about it. What's up with the lighting on this instrument's piano keys? The sharp keys don't leave any shadows, but yet when a white key is pressed, a shadow is drawn that doesn't cover the whole key! 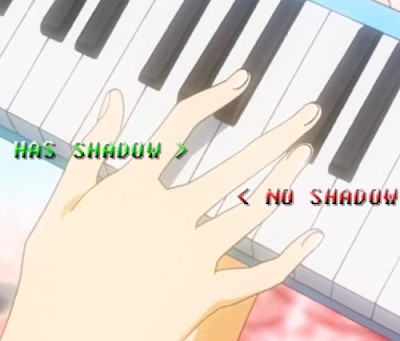 Also, Kaori's fingers don't have shadows, but one does when she is pressing the A# key. Strangely, the animator wasn't even consistent as her other middle finger doesn't have a shadow despite it doing the same thing, only on the C# key. I guess they were too lazy to draw the black key pressed down, so they just drew a shadow instead... I know, I'm no artist, but if I were in their shoes, I'd be questioning what I was doing as I drew this cute instrument and illogically-drawn finger twisting...but I digress, back to the main point. 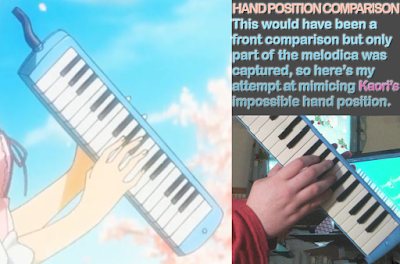 Now, I didn't get this melodica just so I could have something like the cute instrument Kaori plays. I also got it for Mary's Magical Adventure. During Mary's story, Mary will meet Princess Peppermint, which I brought up in a previous blog post. I wanted her to have an instrument she plays, and that her instrument-playing would be recordings of me playing the real instrument. The then-recent discovery of this melodica led to me making her instrument be it rather than the recorder, since the melodica is easier to play for a...pianist like myself. Anyways, that ends the first post in this series! Sorry if it seemed roughly written; I seem to feel tired or something and that causes me to write and even play Minecraft worse in my let's play! It is a nice instrument that I wouldn't have gained interest in if it wasn't for anime. It's a cool instrument, but I don't seem to use it lately due to my really picky nose. I just don't want any nasty smell going into it, because if I breathe in a bad smoky smell then blow into it, that will pass through it.